When finishing your basement, you have lots of things on your mind. Heating is often relegated to an afterthought. Yet even the warmest basements run 5-15 degrees F cooler than grade-level floors. This is just the inherent nature of below-grade living. This means you need at least some type of heating. Couple that with the fact that your basement may not have originally been built with living in mind. Translated, this means that many of the things you need in order to heat your basement may not be there: ducts, power, and proper ventilation. Don't despair, though. Basements can effectively be heated to keep you toasty and warm, and usually though a combination of methods. New houses under construction are easy to heat. HVAC that services all floors is part of the plan. But options dwindle if you are remodeling a basement that has already been finished or partially finished. Closed walls and ceilings inhibit your chances for running ductwork and electrical wiring. No retrofit basement heating will be as sleek and invisible as installing heating before finishing, and none will be as simple or cheap. But it is guaranteed that all retrofit options will be superior to wrapping yourself in quilts and freezing in your newly refinished basement. Summary: Unless you live in an unusual climate, your house will already have an internal heating system. So it is logical to work off of the existing heating and extend it into the finished basement area. Advantage: This is one heating option that will allow you to maintain and even increase your home's value. Disadvantage: It is difficult to send the heat either upstairs or downstairs only, short of physically shutting off each heating register by hand. In many instances, the ductwork is visible and accessible from the basement. Consult an HVAC professional before extending the ductwork. While it seems easy, there are more important issues at hand that only an HVAC professional can help you with, such as calculating heating load and size and configuration of ductwork. If you are installing a new furnace for your home with no current intention of finishing the basement, you may want to choose a more powerful model than is needed for the existing space, thinking ahead towards an eventual refinishing of the basement. Even if you do not have the luxury of doing this, it is possible that your HVAC system might be able to handle the load of increased space to heat. One downside: when beefing up your entire heating system, changes apply to the whole house. If your family has a movie night in your newly refinished basement and you turn up your forced air heat, it will also heat the upstairs even though there is no one up there. Summary: Convection or hydronic electric baseboard heater hardwired into home electrical system. Advantage: Spot heating where you need it. Each room in the basement can have its own baseboard heater. Disadvantage: Baseboard heaters are notorious for stealing valuable wall space. Not only that, baseboard heaters can be energy-inefficient (though purchasing hydronic heaters will make serious inroads into this). Electric baseboard heaters are not the most elegant solution. These heaters are long and quite prominent metal units that, as the name suggests, run along the baseboard of your walls. Baseboard heaters do not need to run the entire length of the wall, just in certain places. As with extending your HVAC, baseboard heating means planning for how much heat you need for a given room. At the least, you will need one baseboard heater per room, as the heat from baseboard heaters does not travel from room to room. Many homeowners who choose the option of electric baseboard heaters do so with the understanding that the basement is a basement, and it does not play by the same rules of aesthetics as the upstairs area. So, even though baseboard heaters may not be acceptable upstairs for the standpoint of physical beauty, they are perfectly acceptable in the basement. Installing electric baseboard heaters is not as simple as screwing them into the baseboard and plugging them into an ordinary outlet. The larger, 96-inch models draw enough power that they require a 20 amp, 240 V circuit. Consult an electrician ahead of time. All of these heaters will need to be hard-wired into the supply circuits, rather than being plugged into the wall receptacles. One great thing about baseboard heaters is that they allow you to sequester the heat into just the areas where you need the heat. These heaters can be individually controlled with separate thermostats or even completely turned on or off, as needed. Summary: Plug-in electric baseboard heaters that look exactly like their hard-wired cousins. Advantage: Portable. Also, they disperse heat better than the tiny space heaters listed below. Disadvantage: These are space heaters that truly take up space. In fact, they are worse at this than hard-wired baseboard heaters because they sit on the floor, not the wall. 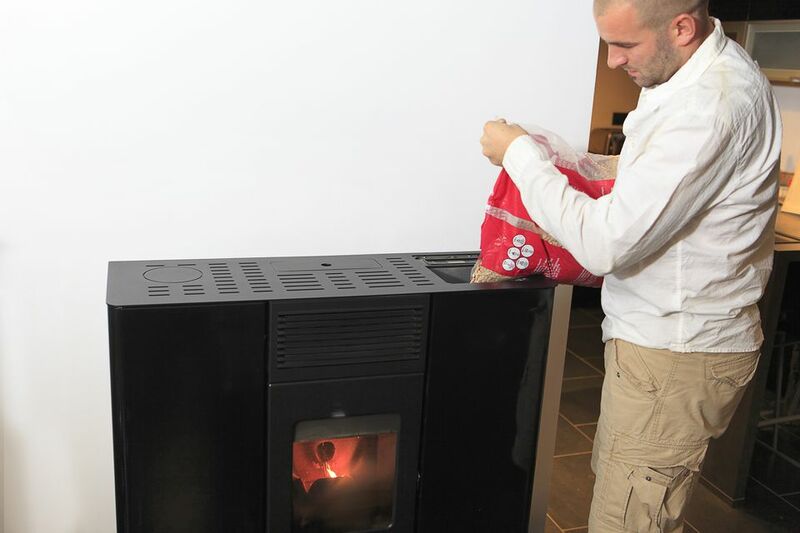 Summary: Stoves that burn wood pellets and push out warm air with a small fan. Advantage: Pellet stoves do not require a huge electrical draw. Disadvantage: You need to vent stoves to the exterior. In addition, pellet stove indicate a certain style preference that cannot be ignored. For example, if you want an ultra-modern basement, a pellet stove will do nothing to add to this look. An alternative and greener option is to install a wood pellet stove. These heating sources rely on manufactured pellets as an energy source and burn clean. These recycled pellets burn at a slow rate of combustion and, fortunately, require only a 110 V plug-in outlet to run the motor that circulates hot air. Unlike baseboard heaters, pellet stoves are not entirely basement-internal. Because these stoves produce carbon monoxide, you will need to vent directly to the outside. Summary: Plug-in electric space heaters that heat an "area within an area." Advantage: Complete portability. Very cheap to purchase. Disadvantage: Space heaters are the least energy efficient choice in this list. Space heaters are familiar to anyone who has lived in a cold apartment or dorm room. Cheap to purchase (nearly all cost less than $100), they plug directly into an ordinary household outlet and start blowing heat right away. No need to wait for HVAC technicians or electricians to do their work. Fan-driven convection heaters are the least expensive and also the least efficient. Large, flat, micathermic heaters install on the wall like a flat-screen TV and slowly heat the room. Portable radiators roll into the room; their oil-filled cores retain heat even after the heating element has turned off. What if your HVAC system cannot supply enough heat to the entire house? It is possible to make do with temporary measures such as shutting off the upstairs registers by hand if you plan to be down in the basement for awhile. You may just have a trickle of heat coming through the downstairs basement registers. Do not discount the value of this low-volume heat. It is possible to run the furnace long enough to take the chill off of the basement room, lightening the energy draw on the electric baseboard heaters. By having the HVAC work in combination with the baseboard heaters, you should be able to supply enough heat for your basement. Simply providing enough wall insulation and adequate subfloor and underlayment may be enough to tip the balance of any HVAC system that is putting out some, but not enough, heat for the basement area.